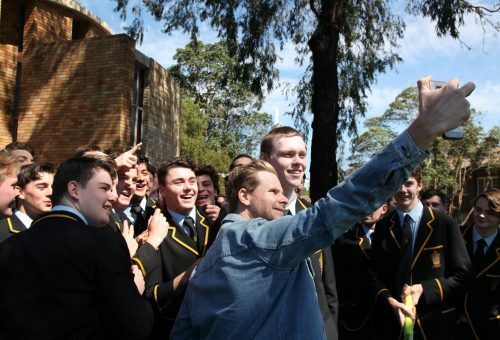 Former Australian Cricket Captain and Sony Foundation Ambassador Steve Smith, was a special guest at the Year 11 Assembly held on Thursday 27 September. During the Assembly, the cohort presented Steve with a cheque of $5,200 which he accepted on behalf of the Foundation. The money was raised by the students who took part in a walkathon in support of their friend, Nicholas McKenzie, who is recovering from a rare form of bone cancer. The boys enjoyed have their photo taken with the legendary cricketer who in turn took selfies and left Nick and his mates with a signed cricket bat.